Concessions brand Aramark is bringing the traveling draft beer stations to ten NFL teams. At NFL games, you spend plenty of good money on both seats and beer—and then spend an annoying amount of time not in the former as you try to get the latter. Concessions company Aramark, which works with over a dozen NFL teams, clearly understands just how frustrating this conundrum can be, so for the 2018 season, it’s introducing a crazy new contraption to hopefully make scoring a brew significantly easier: a fleet of BeerCycles. Jokingly referred to as a “Tour de Taps,” these three-wheeled bikes are both mobile and interactive, giving fans a new option to buy… get this… draft beer. Yes, unlike the classic beer vendor carrying around a cold tub of bottles and cans, the back of these pedal-driven carts has a serving area big enough to offer up two different varieties of beer on tap. And Aramark promises they’ll be gussied up with your team’s colors ready to serve beer in general concessions areas on game day. A total of ten NFL stadiums will get the cycles this season—the Baltimore Ravens, Chicago Bears, Cincinnati Bengals, Cleveland Browns, Houston Texans, Kansas City Chiefs, Minnesota Vikings, Philadelphia Eagles, Pittsburgh Steelers, and Tampa Bay Buccaneers—according to the Baltimore Business Journal. Though Aramark didn’t specifically say what beers would be seeing this traveling treatment, the company did say eight of the carts would serve Anheuser-Busch products while the other two would go the MillerCoors route. 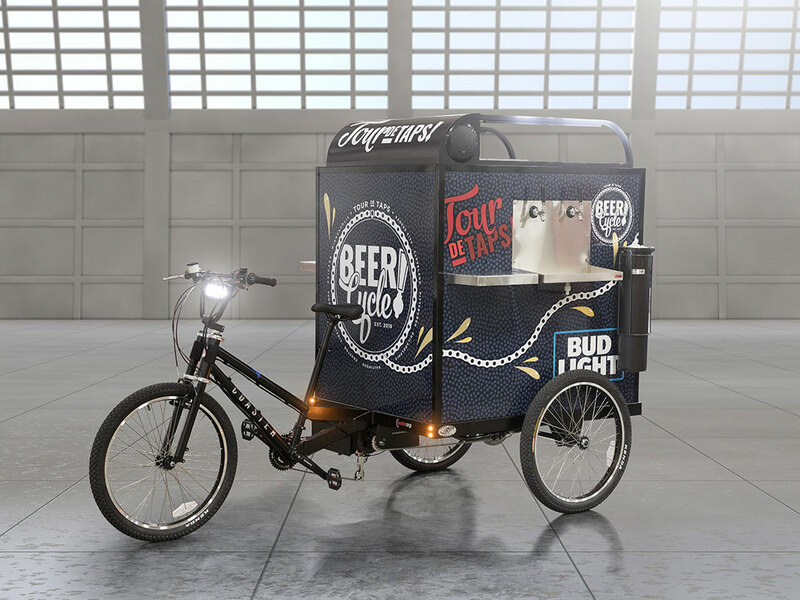 “We believe this is the first time BeerCycles have been deployed inside a sports venue,” Aramark spokesman David Freireich told the business site, stating what seems like the obvious. “The introduction of the BeerCycles is keeping in line with our effort to create more portable stations that can go where the fans are…. At the end of the day, it’s about finding new and innovative ways to not only reach fans, but deliver an enjoyable service experience.” From here, it seems like there’s only one way to make things even more enjoyable: Let the fans ride the BeerCycles back to their seats. You’ll be the hero of your section!